Virtual Online Wedding & Renewal of Vow services are brought to you by DreamTeam Adventures Co. Ltd. , which has been a duly registered company in Phuket, Thailand since May 2003, while earning a reputation as one of the Kingdom’s premier corporate team building consultancies. The Virtual Celebrant, Barrett Agent, conducted his first wedding ceremony in 2001 while employed at the internationally renowned Banyan Tree Phuket Resort & Spa. ​He has since had the honor of marrying well over a thousand couples in only a part-time capacity, and it's something he truly hopes to continue doing for many years to come! Barrett has also been a long-time avid extreme sports and adventure enthusiast who believes in living life to the fullest, and he guarantees to bring these same dynamics and emotions to your VOW Ceremony. 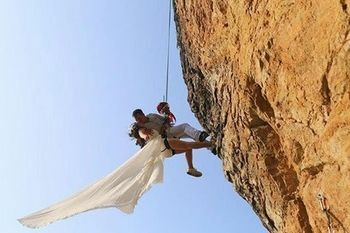 He would likewise be thrilled to assist fellow adventurers who wish to experience a VOW Ceremony during whatever outdoor sport they're passionate about, with Mother Nature providing the beautiful scenic backdrop. ​Come share the powerful emotions during your Virtual Online Wedding or Renewal of Vows Ceremony! As Celebrant Barrett always highlights to couples the importance of great teamwork in their relationship if they desire long-term success and happiness – because essentially we're talking about the most basic and important kind of team in the world! 1) Is Barrett Agent the Virtual Celebrant’s real name? 2) Are VOW Ceremonies legally binding? That said, Barrett is able to assist with proxy marriages if couples prearrange all of the legalities. Likewise, all couples are perfectly free to experience a Virtual Online Wedding Ceremony whether they are legally married or not! We welcome couples of all kinds and statuses, as long as they are of proper age in their country of residence, (and have a decently good internet connection). 3) Do we need a super high tech set up or ultra-fast internet speed? Of course the better quality your devices/accessories are, as well as the faster your Internet or Wi-Fi connection you have access to, the better and clearer the Virtual Ceremony experience will be for you (and your ceremony video recording). That said, most any decent set-up will do (you could even use your mobile phone if you really wanted or needed to, e.g. maybe you’re in a hospital, or about to jump out of an airplane). ​4) How long do VOW Ceremonies usually take? Both Unity Wedding and Renewal of Vow Ceremonies usually take approximately 25-30 min. (plus approx. 5 min. for the Final Pre-Ceremony VideoCall). 5) What style of wedding ceremony does the Virtual Celebrant conduct? Both Unity Weddings and Renewal of Vow ceremonies are most typically delivered in non-religious, Western-style format (pretty much like you’d see in many US movies), which focus on the couple, their emotions, as well as the dynamics and future of their relationship. Your ceremony can be very private with just the two of you, or if you would like to have online guests participate or observe, this is easily accomplished via Skype, Facebook Live Chat or YouTube Group Video chat. 7) How should we dress for the ceremony? Your attire or style is completely up to you! From formal wedding dress and dapper suit to casual with shorts and flip flops, or even semi-naked on a mountain top for all we care – the Virtual Celebrant is an open-minded gentleman who puts the dreams of his couples first. ​8) What if we’re shy or not great English speakers? No problem! – and all the more reason to try a very private VOW ceremony! – as there are no pressures or distractions, just the two of you and the Virtual Celebrant – who has lived half his life overseas and speaks clear, easy to understand English. ​And further, unless you want to bring in your own personalized vows or poems (which you can read from a paper or phone), you really only have to remember 2 words –for the “I do” part of course – other than that you only have to repeat after the Virtual Celebrant during your Exchange of Ring Vows – it’s so easy and stress-free! 9) Does the couple need to be together in the same location? Absolutely not – while it is ideal if they are together, we can also easily set up a VOW Ceremony via Group Chat to help partners in different locations, even if they're on opposite side's of the world! Virtual Online Weddings is the first to provide couples with this ability using real-time, live VideoCall connections, and the Virtual Celebrant stands by to happily assist all. 10) Can the Virtual Celebrant perform ceremonies in languages besides English? Apologies, he can only perform VOW ceremonies smoothly and by heart in English. ​That said, Skype has recently implemented real-time language translations if a couple really wishes to have them (though note there is currently some delay between the speaking/translating/listening, and not all languages may be featured). 11) What if we want a super private ceremony, without anybody but ourselves ever seeing the recorded video/images? As per our Terms and Conditions page, Virtual Online Weddings/DreamTeam Adventures Co. Ltd. reserves the right to use any videos or photos taken during our VOW Ceremonies for marketing purposes, though be assured any such usage would be professionally and tastefully presented. 12) How can a VOW Ceremony helps us if we're already married or been together for a while? ​In the process of re-connecting your hearts, a personalized, real-time VOW ceremony is the perfect way to remind you of the essential elements leading to a happy, successful and long-term relationship. Furthermore, it will almost certainly add some spark if not intimate romance to your relationship!